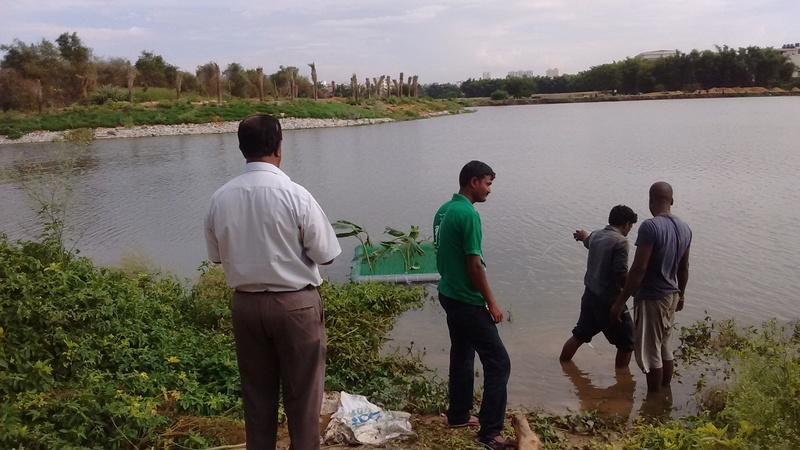 We are delighted to tell you that our low cost, low maintenance Artificial Floating Island (AFI) has been introduced at Madiwala Lake! Karnataka Lake Conservation and Development Authority (KLCDA) plans to introduce these in Agara lake as well. Last month, on 12th July, Ms. Seema Garg, the new CEO of KLCDA had visited Puttenahalli Lake and shown great interest in our floating wetland platforms. She informed the officers in charge of setting up the Bio-diversity Park at Madiwala Lake about our innovation and they in turn visited our lake on 21st August 2017. We took Mr. Chidananda, Dy Range Forest Officer and Dr. Padmavathi, Project Coordinator, around the lake and briefed them in detail not just about the AFI, pipe frame aquatic plant holder, buffer strip AFIs, native plants but also about the buffer strip in the main body, grill for the silt traps, artificial perches in the lake bed and more. 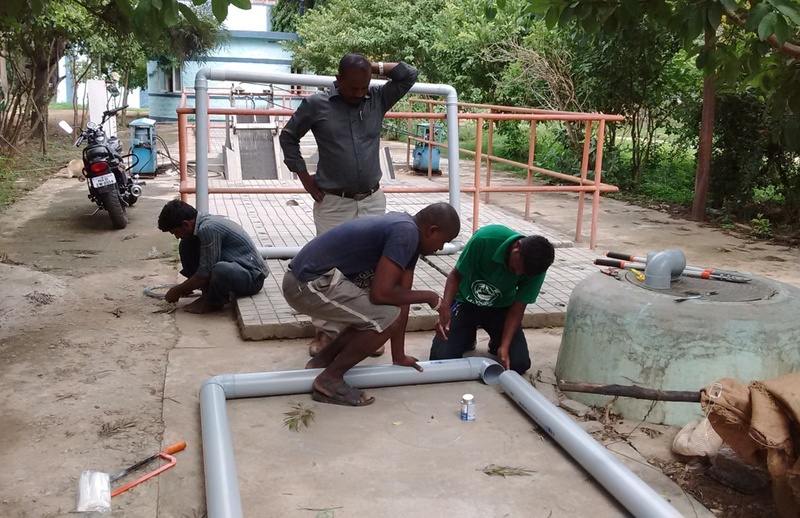 We agreed to help them whenever they get the material to make a platform. Just two days later, they invited us over to teach their gardeners! 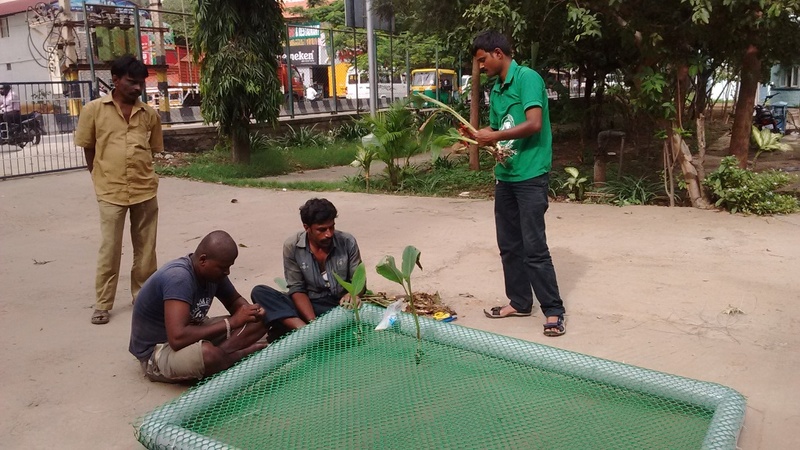 On 23rd August, we went with our gardener, Jayanna, to Madiwala Lake and showed them how to make a prototype, inserted canna bulbs and finally floated it in the water. 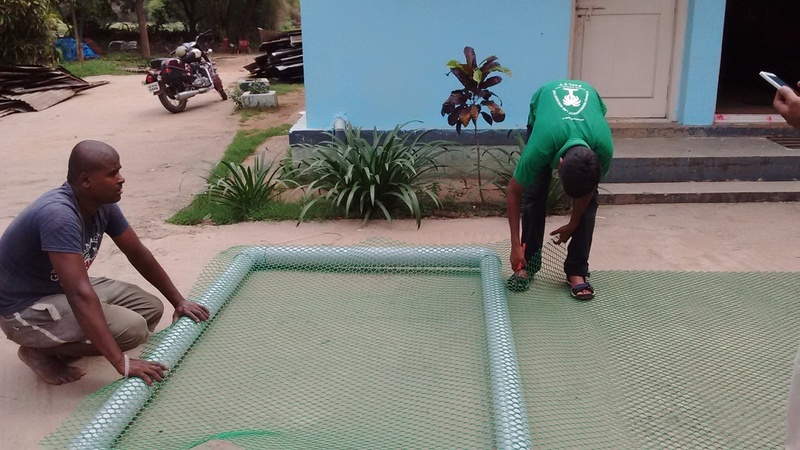 I don’t know who was more thrilled – KLCDA officers, their gardeners or our PNLIT team! We had first taught Himanshu Arteev from Biome in December 2016 and given him two platforms to exhibit at Kaikondrahalli Lake. Subsequently Biome introduced it at Jakkur lake. By absorbing the nutrients, the plants in these floating wetlands purify the water. Obviously the improvement is slow and gradual. Also, the system may not work if the lake is full of sewage. It can only complement not replace the constructed wetland. We nevertheless hope that our AFI does as well in other lakes as it does in ours!